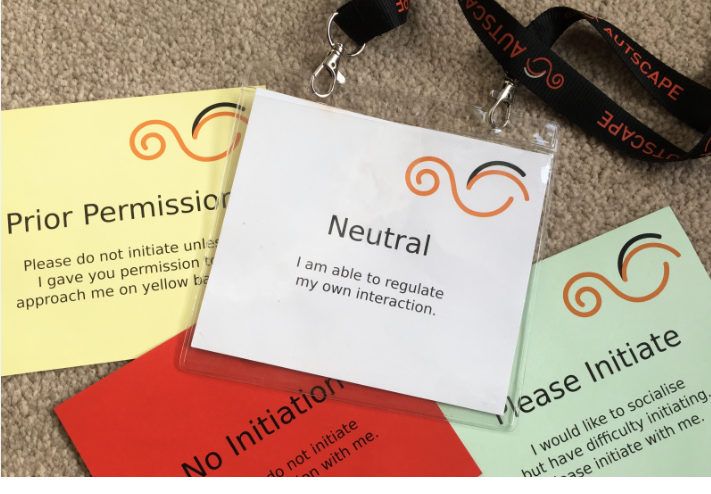 What would a conference be like if it was set up by and for autistic people? I had the chance to find out last summer when I went to Autscape with Edward. Autscape is a conference organised by autistic people for autistic people. Non autistic people can attend but the conference is not organised with them in mind. 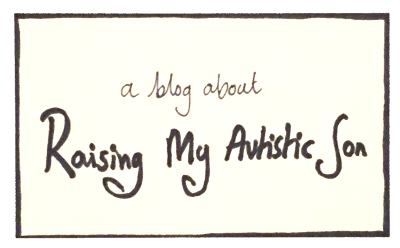 I wanted to take Edward to a conference where he’d have the chance to meet a wide range of autistic adults and I also wanted to find out how an event set up by and for autistic people would compare with usual spaces. The handbook had A LOT of detail in it and explained things really clearly. It explained who to talk to when you had a problem, (and also who not to talk to about problems) It explained when you could raise a concern and when you couldn’t and it introduced us to the badge colour communication system which was genius. Let me explain. During the conference you had a choice of 4 different coloured badges to wear on a lanyard. Each colour indicated that you wanted a particular level of engagement from those around you. Red meant “No Initiation – Please do not initiate any interaction with me”. Yellow meant “Prior Permission – Please do not initiate unless I gave you permission to approach me on yellow badge”. What a great idea – no need to try to puzzle over unclear body language and wonder whether someone wants to be talked to or left alone. I saw all colours of badges being worn (notably more red badges at breakfast time) and people generally respected other people’s badge colour. Edward and I stayed on white mostly. Another noticeable difference was the amount of people STIMing. STIM is short hand for self-stimulatory behaviour and can be any kind of repetitive behaviour which is done for the sole purpose of delivering sensory input to oneself. (I’ve written about this before). At Autscape people were actively encourgaed to stim if they wanted/needed to. They were invited to be themselves and reassured that this was indeed a genuine invitation which it was. People were mostly very tolerant of each other. There was a sensory room available throughout the conference for people to go and chill out in and there was also a quiet dinning area near the main dining area for people who found the main dining area too overwhelming. People were invited to do what they had to do to stay well although they were asked to try and respect other peoples needs when their was a conflict of interests. Instead of clapping which can be difficult for some autistic people to tolerate due to their sensory processing differences we waved and flapped. So in a meeting if anyone said something which you strongly agreed with you could flap to signal your encouragement or approval. I’m used to being with Deaf people so I felt quite at home with the silent waving substituting hand clashing applause. There were a lot of talks about autism and related topics during the mornings but there was also a lot of free time too. One room was set up as a games room with lots of jigsaws and the most geomag I’ve ever seen in one place. Some people played role playing games whilst others did jigsaws by themselves. In the evenings there was usually at least one or two organised things going on. This included a glow stick party which was basically people playing with lights in a dark room for a very long time, a pub quiz with a difference (not really any questions on entertainment or sport but a whole heap of questions about star trek, science, technology, trains, harry potter and pirates (I didn’t see the last one coming either! )), a talent show, a fairly harrowing but extremely well performed play about mate crime which had an autistic actor performing as the lead character, a cinema room and of course the bar. Participants also had the opportunity to join a home group. The home groups had 8 -10 people in them and met twice a day before lunch and the evening meal. It was a chance to meet other people and I thought it was a good way to help people who had come on their own find and make friends. My group were really friendly and welcoming to Edward and me. I think the thing that perhaps struck me the most was how accepting people were towards Edward. As a 16 year old unfamiliar kid he was included and drawn into conversations by adults of all ages. There were all ages of people at the conference from young children to white-haired elders. People who had known they were autistic for years and others who had only recently found out. There were quite a lot of LGBTQ people at the conference and we were all given preferred pronoun badges to wear if we wanted to. People I met at Autscape described it as being the highlight in their year, the place where they could truly be themselves. Somewhere where they felt accepted. Maybe we need more Autscape like places. If you want to go to Autscape 2019 it is being held 12- 15 August in Hertfordshire. Unfortunately we can’t make it this year but I have a strong feeling it will become a regular feature of Edwards summers in the future.